Chena Hot Springs and the Department of Energy are jointly funding a $1.4 million exploration project designed to locate and characterize the geothermal resource underlying Chena Hot Springs. The goal is to build a model of the deep reservoir using geologic and geophysical exploration techniques coupled with state of the art reservoir engineering. Once the model has been completed, it will be tested by drilling a 4000ft slim hole, sited to intersect the deep geothermal reservoir. We hope to drill this test hole in 2008, depending on funding from the Department of Energy. The Geothermal budget was zeroed out in 2007, and this has effected our completion of this project. David Faulder, PE is responsible for completing the reservoir engineering portion of the GRED III project. David was the first researcher to sign onto the GRED III project, and was very instrumental in writing the initial grant request for DOE. 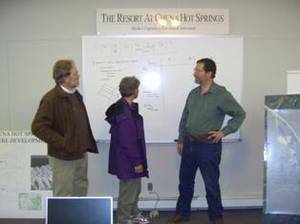 To the left is a picture of David Faulder (far right), along with John Ziagos and Carol Lewis (both from Lawrence Livermore National Lab) participating in an early whiteboard strategy session for the GRED III project. The holes drilled at Chena to measure heat flow have also been used for production and injecting testing purposes to gain a better understanding of the details of how and where hot and cold water is flowing through the fractures. Based on this testing, we are determining the best possible location for a planned deep exploration hole. Modeling of the reservoir also enables us to make decisions about production and reinjection in the shallow reservoir as part of our small scale power plant project. Reinjection, where we return the cooled water to the geothermal reservoir so that it can be reheated and recycled, is critical to the success of any sizeable geothermal development. Future reservoir engineering testing and numerical modeling will indicate how much hot water is available for use and at what rates it can be sustainably produced for future development. Understanding the basic geology controlling the flow of thermal water is the basic foundation for developing a conceptual model of the geothermal system. Geologic mapping as identified a facture network dominated by a fault that runs through the Chena hot springs. Rocks on opposing sides of this fault have pulled apart allowing hot water to quickly rise to the surface from depths of several thousand feet. Near the surface the hot water mixes with the cold shallow groundwater system flowing on and through gravel deposits in the valley. Amanda Kolker, a geology graduate student at the University of Alaska Fairbanks has been responsible for the geologic mapping of the Chena site, under the supervision of UAF researcher Dr. Jess Larson. To characterize fluid-rock interactions in the geothermal system by hydrothermal alteration studies and fluid inclusion studies; To develop a hypothesis for the ultimate heat source of Chena Hot Springs. BACKGROUND: The ultimate heat source driving the geothermal activity in Interior Alaska has not been established. All of the Interior Alaska hot springs areas are in or near granitoid plutons of Mesozoic to early Tertiary age. Chena Hot Springs lies in the center of an enclosing 5x40 km2 pluton. Geothermal activity at Chena Hot Springs may be from deep circulation on back-arc faults, radioactive decay of elements (U, Th) within the granite, and/or a concealed magma body. RESULTS TO DATE: The junction between two concealed, previously unmapped faults appears to be the main upwelling zone for the hydrothermal fluids. The Chena Hot Springs area has likely experienced at least two different intrusive events, one in the late Cretaceous and another in the early Tertiary, followed by mafic dike emplacement. Mineral alteration assemblages record at least three distinct episodes of hydrothermal activity in the area. The oldest assemblage indicates a high- temperature hydrothermal regime and is unrelated to the present-day system. A second assemblage is related to the present system but indicates slightly higher temperature conditions. A third assemblage reflects the present system. All three assemblages are associated with rock microbrecciation, indicating that faults are and have been main hydrothermal conduits for an extended period of time. Fluid inclusion data, chemical geothermometry, and alteration mineralogy all indicate that the CHS geothermal reservoir has temperatures of ~120-130oC. Near the surface, hot water mixes with a cold shallow groundwater aquifer. While there is no evidence for anomalous concentrations of U or Th in any of the analyzed samples to date, this does not completely refute the radioactive decay hypothesis for the heat source of the Interior Alaska hot springs. Almost 20 holes have been drilled to depths from 100 to 1000 feet at Chena, all of which can be used to measure the temperatures and pressures of the shallow geothermal system. These holes have shown that the western part of the geothermal field is where the hottest water is rising from greater depths. These holes have been very useful in helping to outline the location of the fault controlling the geothermal system as the fault is buried by gravel and can not be seen at the surface. The hottest temperature yet measured at Chena is 176.5°F. David Blackwell from Southern Methodist University is the PI conducting heat flow studies. David provided Chena Hot Springs with instrumentation to regularly log the existing well and new TG holes drilled as part of this project. Much of this work, including drilling, was completed during the winter of 2005-06, with temperatures dipping to -50°F. The amount and composition of chemicals dissolved in the hot spring water provides a geochemist with ideas as to the composition of the rocks hosting the geothermal system, the thermal history of the water, and the time since it was last in contact with the atmosphere. The relative amounts of sodium, potassium, calcium and silica tell us that the deep reservoir at Chena has a temperature near 250oF. As the hot and cold waters mix near the surface the chemistry also assists us in mapping out the boundaries of the shallow geothermal system. The chemistry will also allow predictions as to whether or not mineral deposits will precipitate from the water and plug wells or pipelines. Dr. Kenji Yoshikawa from the University of Alaska Water and Environmental Research Center is the PI for the water chemistry and hydrology portion of the GRED III project. Measurements of the physical properties (electrical conductivity, density, magnetic properties, etc.) of the earth in the vicinity of the geothermal system can provide insights into the size and location of the geothermal system. In July, 2005, Zonge Engineering conducted an extensive survey of the valley using techniques with exotic sounding names like natural and controlled source audio magnetotellurics. During this survey, both naturally occurring and artificially generated electric currents were measured to help us further define and outline the deep (700m +) underground geothermal system. As these surveys do not measure the system as directly as heat flow, they can provide more ambiguous results that require careful interpretation. However, they can map much larger areas and used in conjunction with the data from our test holes can provide very useful information.